It's suddenly November. The first day of November. The first day of National Blog Posting Month 2010. 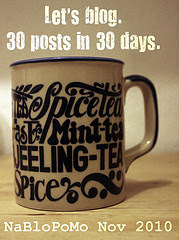 The first day of 30 posts in 30 days. But every year, for the past 3 years, I have participated in NaBloPoMo. I not only participated... I completed at least 30 posts in 30 days. Last year I even won one of the many prizes. So... I'm doing it. I'm going to try it again. I may feel stressed... or strapped for time... or tortured... but I'm going to try my hardest to get in 30 posts in November. I miss my blog. I miss my readers. I miss my comments (hint hint). To challenge myself a little more (because I REALLY need it to be even more of a challenge, haha)... I'll spend day 2 to day 10 of November in Florida. Nothing like doing things the easy way right? Some of my posts might be "iPhoned" in. Some of them may consist of mostly photos. (I will get up right this minute and pack my camera cable or I'll be really annoyed that I'm in Florida without access to the photos in my camera!!!) Some of them might (definitely) be short.